After Queen’s Bureau of Investigation was published, there were no Ellery Queen short story collections until 1965, when Queen’s Full came out. The title referenced the poker hand, and contained three novelettes and two short stories. 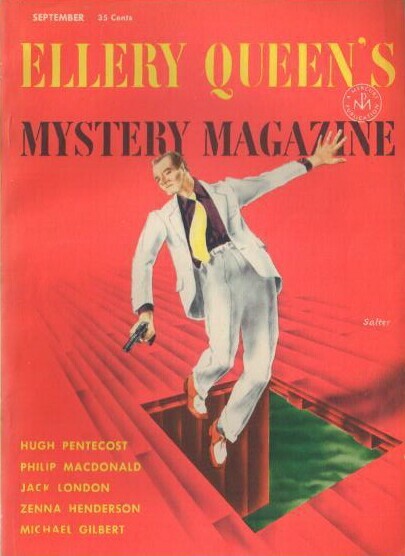 The oldest short story was “Diamonds in Paradise,” originally published in Ellery Queen’s Mystery Magazine, September, 1954. A man dressed as a woman steals a diamond from a Broadway singer at an illegal gambling den, The Paradise Gardens, and falls to his death off of a fire escape while trying to escape the police. With his last words, he names the place where he hid the diamond: “diamonds in Paradise.” So, the police search the gambling den to no avail. Ellery comes along, and declares the diamond is hidden in a pair of dice. I do not think I’ve read anything like this before. an individual with a little creativity. Great job for bringing a little something completely new to the net! I believe I read this one in an EQMM collection several years before discovering the big EQ stories. Because Ellery and his father have been established for 25 years or so at this point, the story contains very little explanation about them, which puzzled my 11-year-old mind.